Even the colour black fails to shrink the sheer size of the latest long-term test car to join the Parkers fleet. 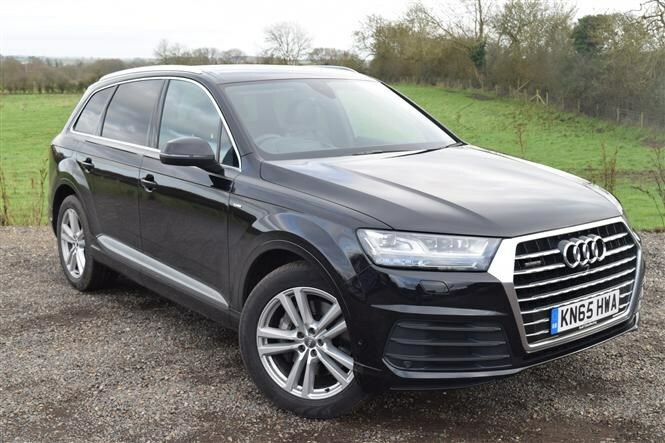 So a big shout out then for the Audi Q7 – launched in late 2015. This new recruit arrives in one of its most popular guises – 3-litre TDI S Line. There is the entry-level SE, which starts at nearly £48k, but folk shopping for a large 4x4 usually splash the cash, so adding another six grand to step up to the S Line is neither here nor there for most buyers. It's, er, very limited. 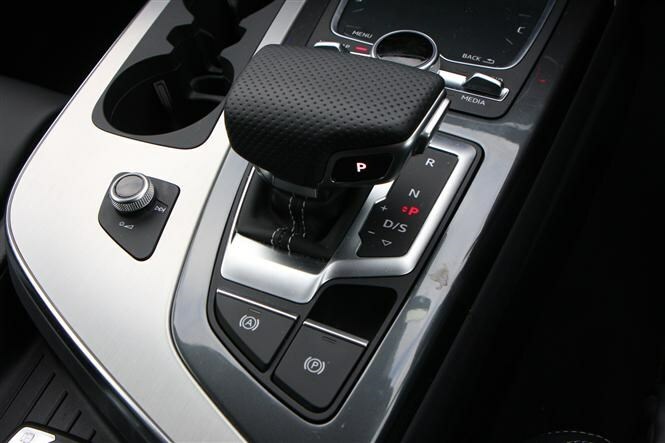 In fact, at the moment you can only buy the 3-litre diesel with the Tiptronic automatic gearbox. The only decision to be made is what power rating you wish for: the 218bhp or the 268bhp? The more powerful engine is reckoned on returning 47mpg on average while the slightly more subdued 218bhp version is claimed to deliver 48mpg. Yes, you read that right - adding another 50bhp means a penalty of 1mpg. So no surprises our test mule has the dial cranked up to the full 268 galloping ponies. We suspect most Q7 customers will do the same. Two things stand out when you first drive the Q7: serenity and size. 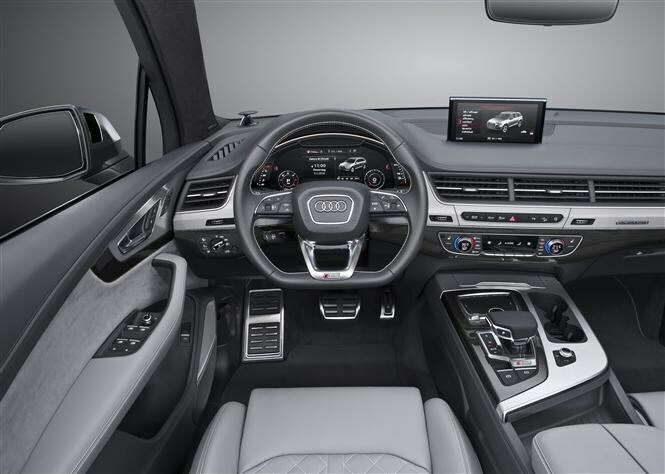 Audi has been building and developing beautifully crafted interiors that do an amazing job of insulating you from the outside world. You simply waft along on a wave of torque that makes overtaking effortless. At night the ambient lighting with its soft glow from footwells and door strips deliver a calmness that many a spa centre can only dream of. Throw in great sound insulation and it’s hard not to believe you could drive through the heart of a hurricane and not notice a thing. That serenity, however, gets a rude awakening when it comes to country lanes and car parks. The sheer footprint of the Q7 is something else to behold and when meeting an oncoming car on a back road, you suddenly feel you’re piloting a tower block. Bridges with width restrictors and multi-storey car parks become tricky places to navigate and leave you with sweaty palms as you fear smearing the bodywork of a £55k car down a concrete bollard or someone else’s car. Not for the nervous driver. The Q7 S Line comes with front and rear parking sensors as well as cameras at both ends. It takes some of the terror out of parking; otherwise you’d need friends to guide you into every space. Winter literally throws up a problem though as all the road muck flung from the tyres coats the reversing cameras, leaving you with a view so obscured it’s hard not to think you have cataracts. Regular cleaning is a must. Our car is fitted with a long list of kit. Neat tech includes Audi’s new virtual cockpit, first seen on the TT, which enables the driver to scroll between different functions that can be displayed between the two main dials, including radio, phone, trip functions and sat-nav. There will be lots more to test, and we’ll be letting you know what is worth having and what’s worth leaving off the options list. Stay tuned for more updates. We’re a couple of thousand miles in to our test with the Audi Q7 and we’ve had our first warning light ping up on the dashboard. Seems we’re running low on AdBlue. This is the additive that is necessary for keeping nitrogen oxide emissions down on some diesel engines. Initially it popped up to warn that within 800 miles the liquid would run out and I would not be able to restart the car until a top-up had been performed. 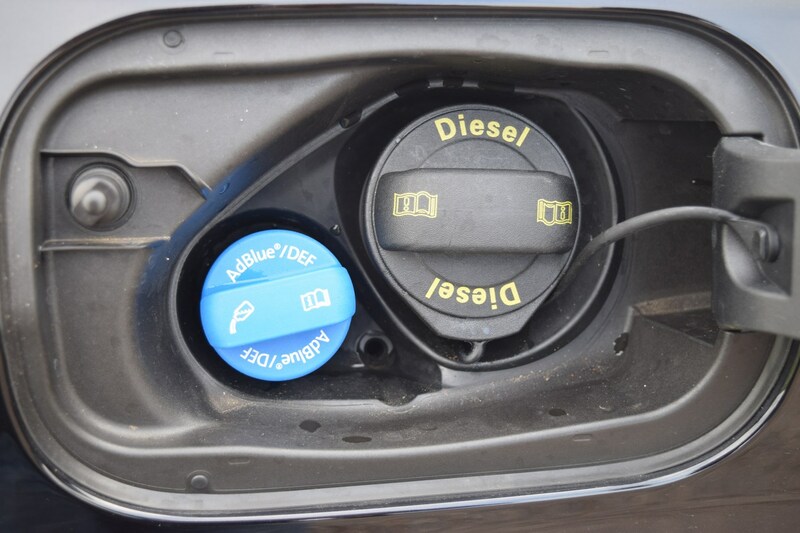 AdBlue should only have to be topped up when servicing is due, thus negating the need to hunt around Halfords searching for a large bottle of the stuff to keep your wheels on the road. So it was a bit of a surprise when the warning light flashed up when the service wasn’t due for another 10k miles at least. Given a trip up to Scotland was due, I couldn’t take the risk of running out so I popped into the Audi dealership in Peterborough. A quick examination revealed that a couple of litres weren’t going to rectify the situation for that long so a full refill was required to get the car to its first scheduled service. Turns out that Audi doesn’t send its new cars out with a full tank of AdBlue so it’s down to owners to refill. Some £45 later the tank was brimmed and I could carry on my way. Our Q7 isn’t exactly slow. With a 268bhp diesel engine that also develops a whopping 600Nm of torque, it’ll cover 0-62mph in 6.5 seconds. That’s quicker than a lot of sports cars, despite its two-tonne kerbweight. But in a world where there exists a market for money-no-object performance SUVs such as the Range Rover Sport SVR, Porsche’s Cayenne Turbo S and even the oddly proportioned BMW X6M, there’s a gap in the market here - and there aren’t many manufacturers better at filling a niche than Audi. It’s with little surprise, then, that the firm announced a performance model of its own to take the seven-seater up to silly speeds. 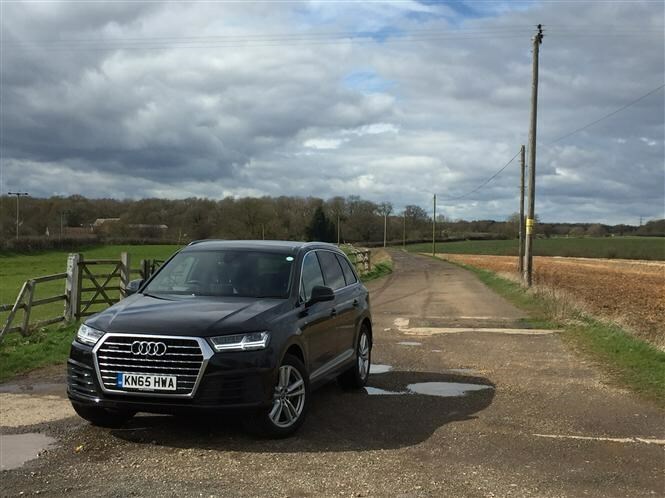 But should you buy an SQ7 TDI over our S line 3-litre TDI V6? Let’s start with the engine, since that’s where the grunt comes from. 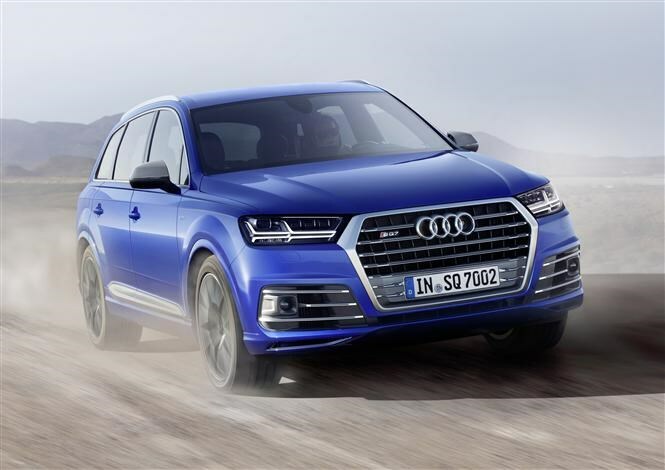 The SQ7 TDI uses an incredibly sophisticated new 4-litre diesel V8 featuring a pair of conventional turbochargers – driven by exhaust gases to force more air into the engine – along with a world-first for a production car: an electric compressor. This has the advantage of operating without needing exhaust gas, so it can function at far lower engine speeds. The result, apparently, is a huge amount of useable power no matter where you are in the rev range, with peak power of 429bhp and as much as 900Nm of torque. Its claimed 0-62mph time of 4.8 seconds looks all the more impressive in the face of claimed fuel economy of 38mpg thanks to the ultra-efficient new engine. Impressive stuff since I’m seeing almost 30mpg during my time with the Q7, despite its claimed fuel economy of 47mpg. One of the reasons the SQ7’s fuel economy is so good relative to its performance is that the third compressor is fed from a 48-volt electric sub-system rather than the engine, and this also powers an active anti-roll system similar to that found on the BMW 7 Series. It should make for eerie levels of ride comfort along with stable, flat cornering. 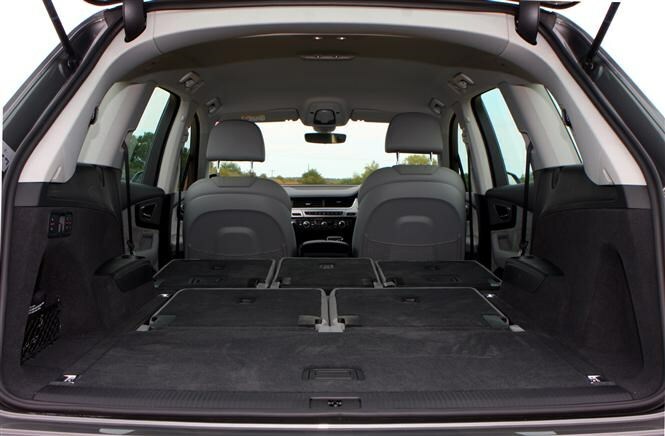 We’ve never had too much cause to drive quickly in our Q7, but that’s probably at least partially due to the fact that its body does tend to roll in corners. Standard on the SQ7 but optional – and not fitted – to our long-term car is the rear-wheel steering system that makes low-speed parking easier. I’ve never thought ours needed it though – it’s surprisingly manoeuvrable at low speeds regardless. 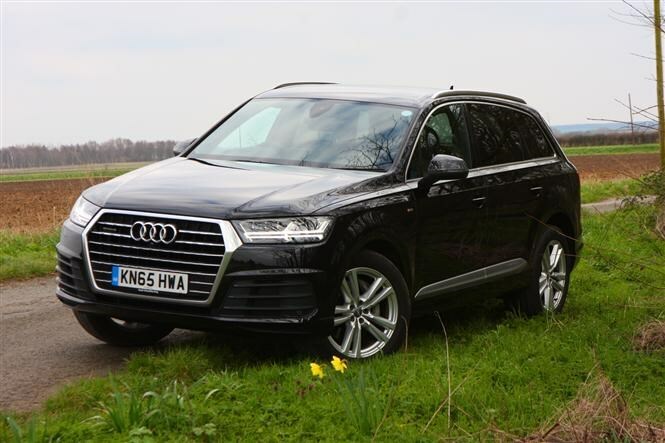 A lot of the optional extras we’d have chosen on our Q7 are standard on the S version, such as the Matrix headlights (£950) and the Technology Pack (£1,950). Ours has a £1,100 Bose sound system, while the performance model gets a choice between that and a Bang and Olufsen set-up featuring 23 individual speakers. 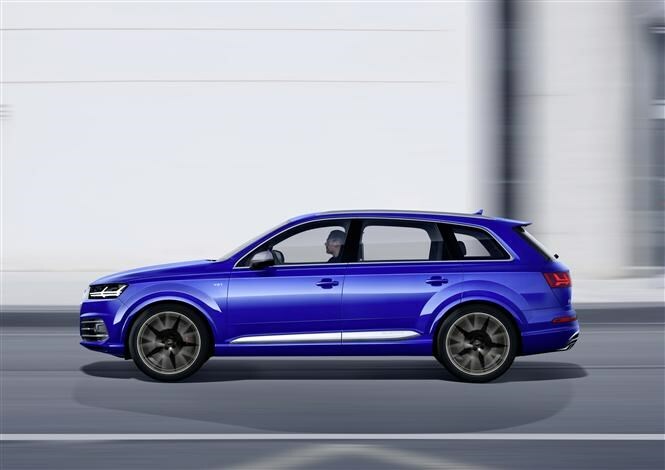 All-in, our Q7 costs £64,445 and we've seen rumours the SQ7 is set to cost around £70,000 when order books open in May 2016. We’ve yet to drive it to see how it performs, of course, but on paper that looks like a whole lot more car for another £5k in a market where buyers would happily spend that on a paintjob alone. 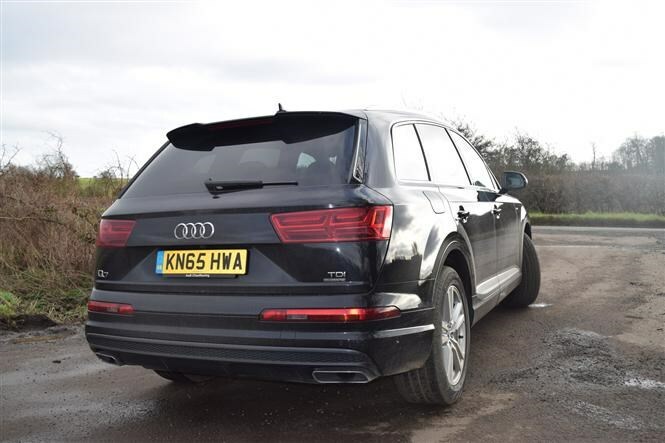 A crack-of-sparrows airport run is a fairly common thing in this line of work, but there are few cars quite as well-suited to it as our Audi Q7 – especially on a cold March morning. After a 4am alarm, shower 15 minutes later and finally locking the front door at 4:45am, pushing the unlock button on the Audi keyfob wakes up the luxurious SUV. Those wonderful Matrix LED headlights have many advantages, but there’s no mistaking their distinctive glow as you approach the car in the pre-dawn haze. 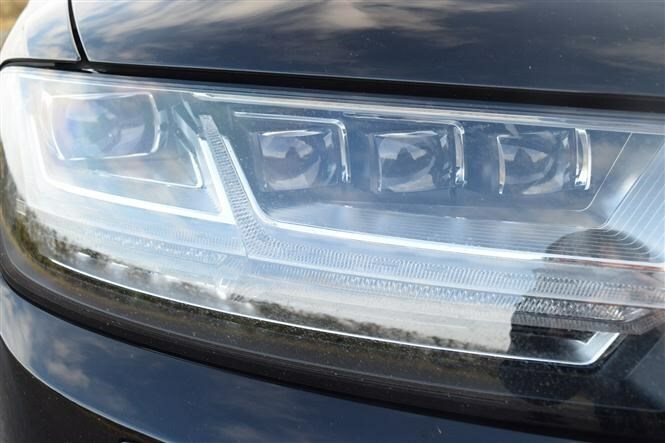 They’re brighter than most other headlights and have an unmistakable shape, so even if you’ve parked in a sea of similar metal it’s always easy to find this big Audi. When it’s below five degrees centigrade there’s no getting around the fact that our £1,100 optional black ‘Valcona’ leather upholstery is going to be cold upon initial perch in the driver’s seat. And why is it that my shirt only rides up, exposing my bare skin, on the coldest of winter mornings? 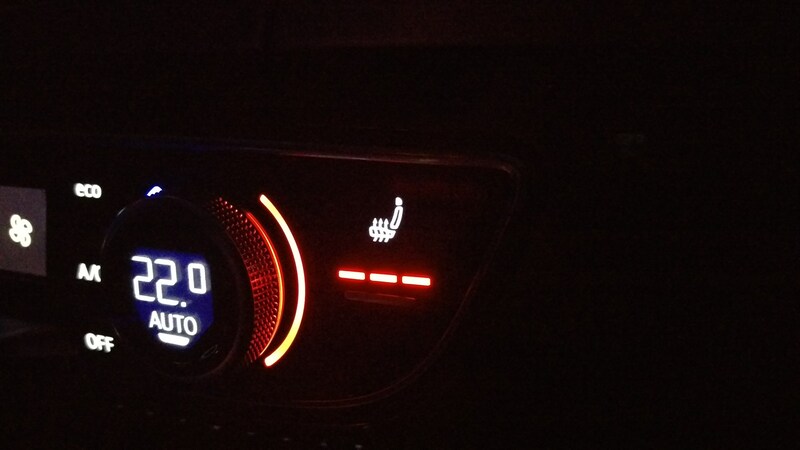 That’s why the second thing I do after hitting the button for the keyless ignition is activate the three-stage heated seat. It’s one of the quicker systems we’ve used; in less than a minute you can feel its effects starting to percolate the hide. It’s at this point I’m pleased Audi boasts some of the best infotainment systems available right now. Using the touchpad located just in front of the gearlever, I’ve quickly learnt to input destinations without having to look down. Sure, you’ll need to keep looking at the screen, so it’s not ideal when you’re driving, but it allows me to input a destination quicker than most other set-ups I can recall. It’s easier still if you’ve been somewhere before; simply scroll down using the rotary selector that is also part of the navigation apparatus. There’s plenty more to explore with this system – there’s a grand total of £4,250 in optional infotainment alone on this car. Once the required terminal is selected, it’s a simple case of dropping the car into ‘D’ for Drive and setting off on my merry way. 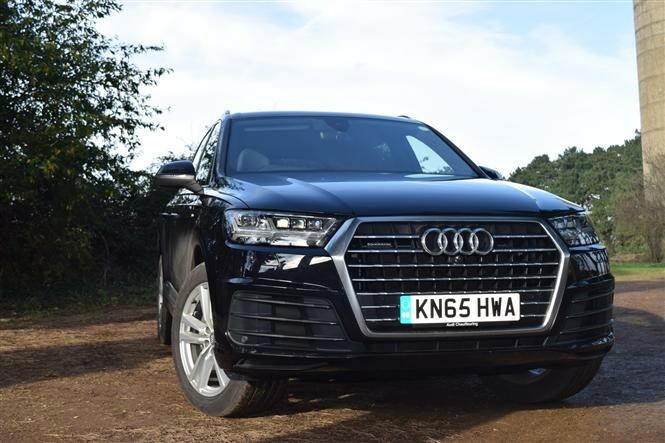 I’m eternally grateful for cruise control on the Q7 – with its torquey 3-litre diesel engine it’s a car that epitomises effortless speed, and I can see it would be quite easy to trigger a speed camera if concentration lapses for a moment. The system on our car isn’t adaptive (meaning it’ll only work to the speed you’ve set, rather than adjusting itself automatically for slower-moving vehicles in front) but it’s very simple use with the stalk control nestled usefully below the indicator stalk on the left-hand side of the steering column. In the not-too-distant past, mention an Audi S line model and thoughts immediately turned to chiropractic health, such was the lumpiness of the ride quality on firm ‘sports’ suspension and tyres with so little sidewall they might as well be solid. Happily, that’s simply no longer the case in the Q7. It’s actually very comfortable, as you’d expect from a luxury seven-seater. 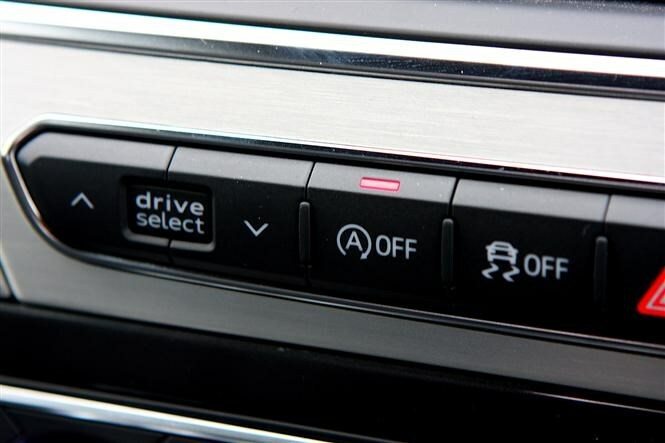 We're less convinced by the drive modes on offer, though, selected by buttons above the left-hand heater controls above. I can’t work out why you’d choose to make a car of this scale sportier than its default setting. Further investigation required, I’d say. 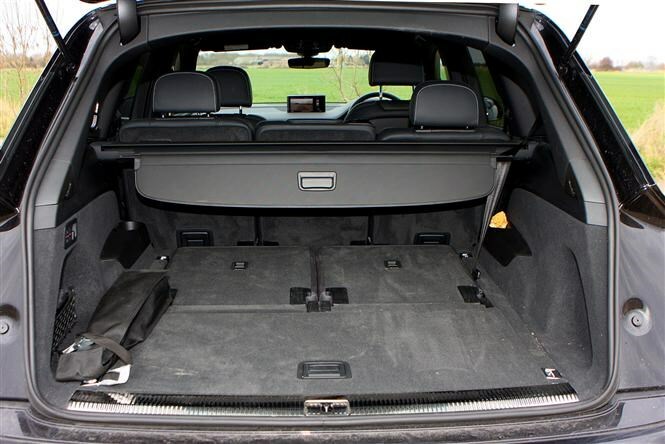 The Q7 is a wonderfully practical car, and nowhere is this more evident than with the boot. 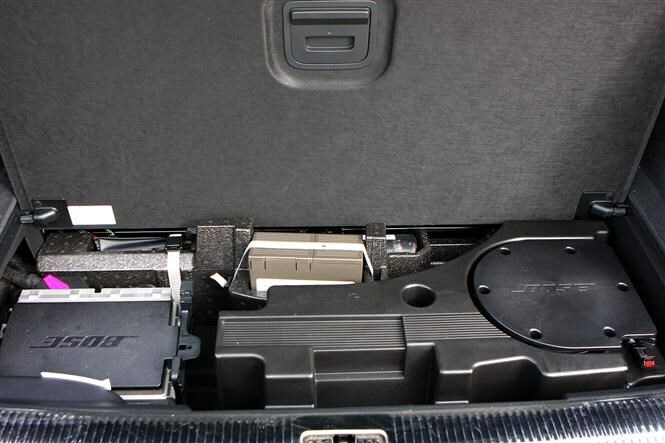 Measuring 295 litres with the third row of seats in place, these can be electronically folded away to unlock a huge 770 litres – more than enough for a decent-sized set of suitcases. 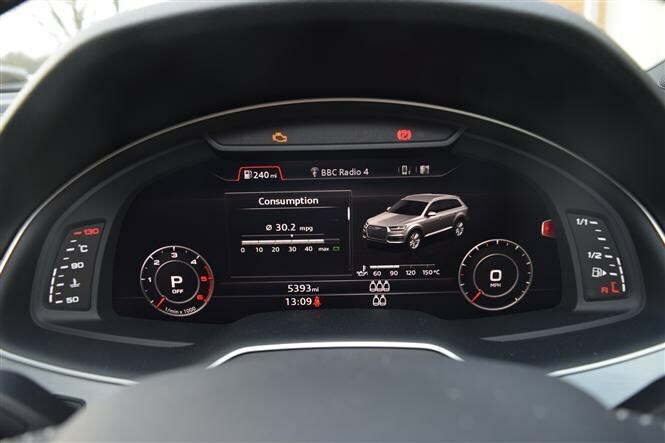 But it’s using this loadspace on a day-to-day basis that highlighted some of this Audi’s clever standard features. My favourite feature is another electronic function: the remote-operated powered tailgate. These are becoming a more and more popular feature nowadays, but I reckon they’re also one of the most useful, especially when the heavens open. Click a button on the keyfob and the rear hatch opens automatically, meaning you can carry all of your shopping direct to the car without having to put it down and fumble with a boot release. There’s a button on the driver’s door that does the same thing, so you’re able to open it when you’ve pulled up in a deluge without having to stand there slowly saturating. Closing the tailgate is as simple as re-pushing these buttons, or the one on the inside edge of the bootlid, and Bob’s your uncle. 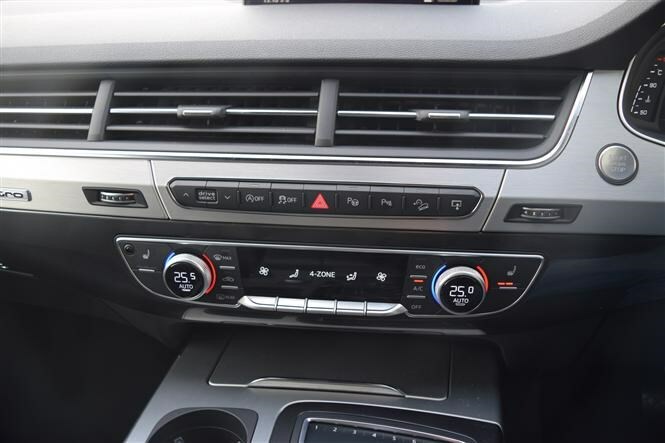 Spend five minutes getting to know these features and you’ll really start to appreciate the Q7’s usefulness as a family car. I’m loving the memory function for the electrically adjustable driver’s seat too. It’s a £350 optional extra, but allows up to three drivers to climb in and find their ideal driving position at the push of a single button. Sound frivolous? Try getting in and leaving in a hurry when the previous person who drove the car is a clear nine inches less tall than you are. This exact situation happened to me when I was late to an appointment, and the job was done in seconds rather than minutes. Did it save my bacon? Quite possibly, and I can certainly see the benefit. 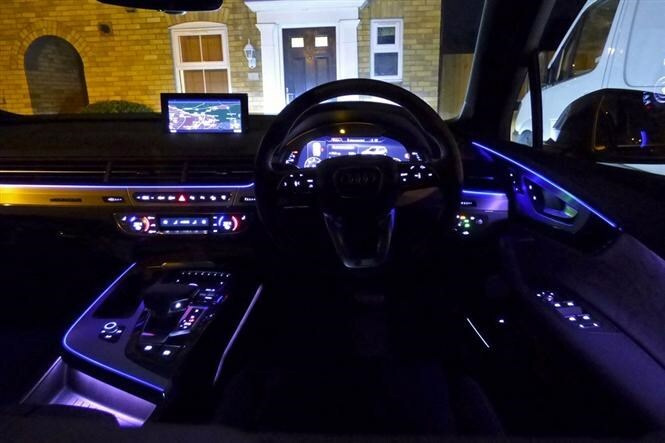 It’s clear the Q7 would be a great chauffeur’s car. It’s gigantic inside, comfortable, stylish and well equipped. It cruises well at low speeds and the back doors open nice and wide for easy access. The tailgate’s even powered so your man can open it while coming around to help load your shopping in the boot. But there’s one thing that sullies the experience. It’s on almost every new car on the road these days and prevents smooth progress: the stop/start system. 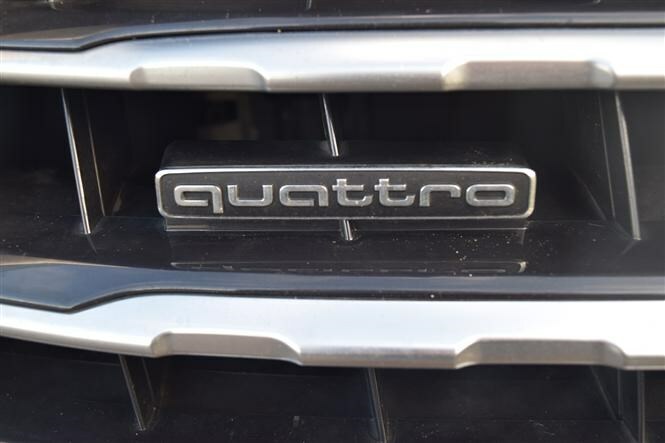 It’s there to save fuel and lower tailpipe emissions (thus saving rainforests, pandas and other endangered organisms) by switching the engine off when the Q7’s stationary, but all too often you’re on the accelerator again before the car has turned itself on again, resulting in a lurch away from standstill. Annoying for a driver, but a deal-breaker for a highly strung back-seat client. Tellingly, I bumped into a professional chauffeur the other day and he told me he switches it off the second he gets into a car. It’s the button in the picture above, if you’re wondering. If you look at it objectively, £1,100 is a lot of money. 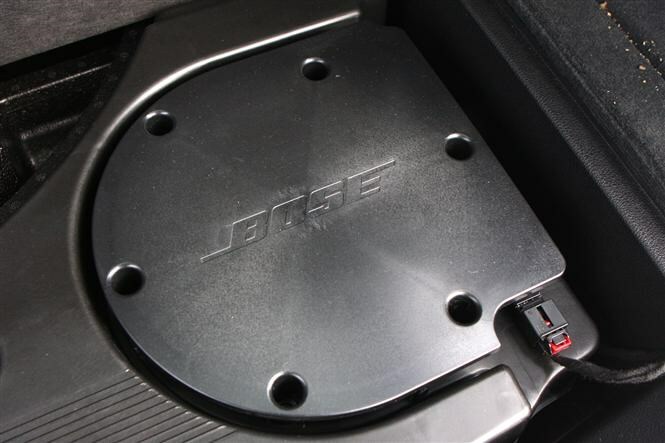 In this article, however, I’m going to argue that it’s not all that much at all for the excellent Bose 3D sound system installed in our long-term Audi Q7. That’s an impressive line-up for any in-car entertainment aficionado, and believe us: it works brilliantly. There’s a real depth in sound quality from the ensemble and you don’t have to turn it all the way up to 11 to experience it either. This system automatically adjusts the hi-fi’s sound output to compensate for road, wind and engine noise too, meaning you don’t have to turn it up and down while you’re driving. 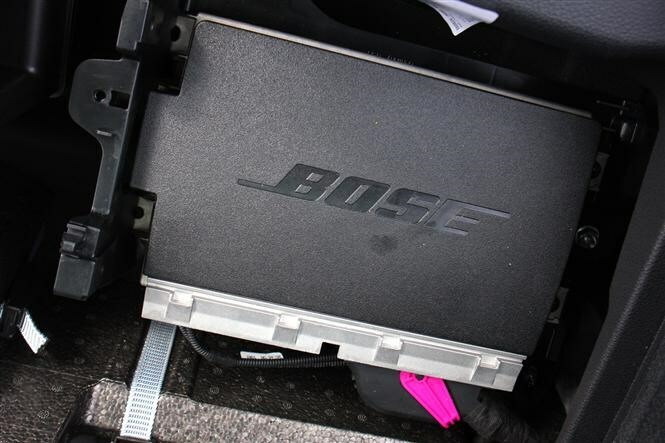 Another feature included is called Bose Advanced Staging Technology, which is the tech that produces the 3D sound. It filters vocal and instrumental sounds to direct them wherever you choose within the cabin, meaning it’s possible to set the car up to sound exactly as you and your passengers want. With that sort of capability, how much better can the Bang and Olufsen set-up really be? Completely unimpressed with the new Q7’s styling (am I the only one who prefers its sleeker, smoother predecessor? ), I was nevertheless keen to try Audi’s seven-seat monster for two reasons. First, I’m a fan of the new-ish ‘premium alternative’ big SUV from Sweden, the Volvo XC90, and wanted to see how the two compared. And two, I had an old shed to empty, destroy and then carry to the tip. 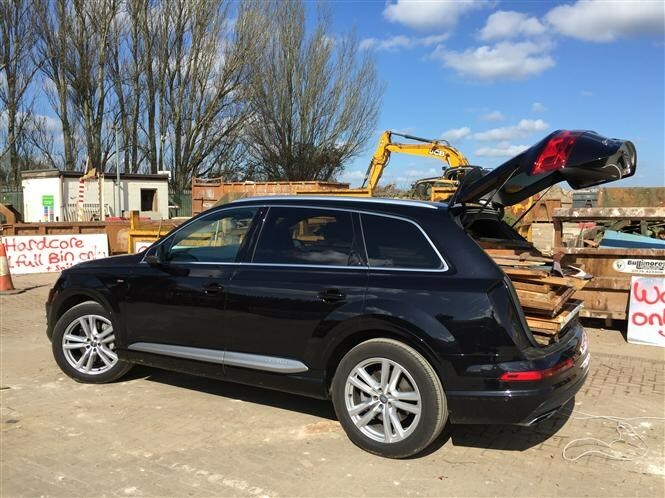 What better tool for the job than the Q7 with its electric-folding third row and 1955-litre cavern out back? Cool, modern Volvo? Or dark and techy Audi? From behind the wheel you’re struck by the lack of design flair relative to the cool, lounge-like Volvo. 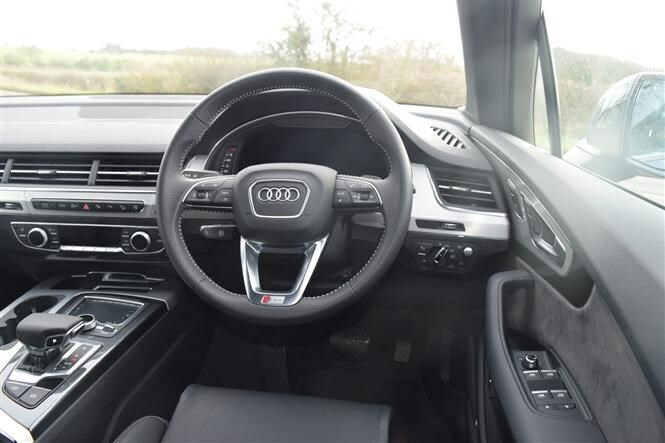 Where the XC90 uses open-pore wood, knurled metal finishes and leather in light shades to deliver a cabin ambience that feels fresh, welcoming and modern, the inside of the Audi is suitably techy and dark. Very dark. The multiple interfaces are initially confusing too, compared to the self-evident, intuitive iPad-style touchscreen interface in the Volvo. 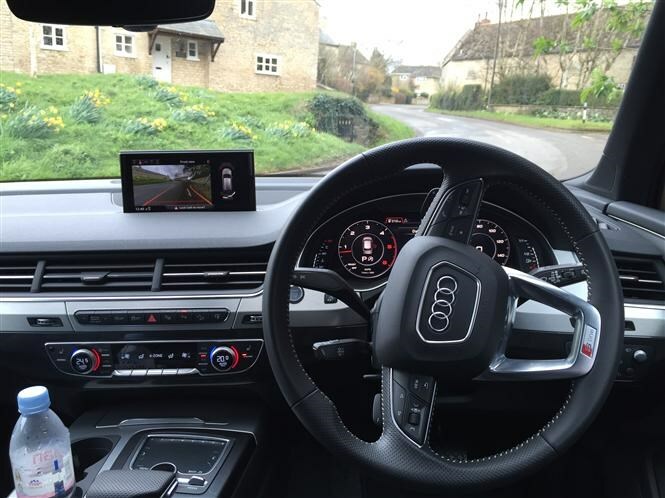 But the Audi's seats, driving position and steering wheel (the three-spoke Sport wheel on this car) are fabulous, the much-vaunted Virtual Cockpit excellent – on which the virtual speedo and rev counter can be minimised in favour of, say, a full-width navigation display – and the hushed sense of refinement immediately calming. On the move the Audi’s slick proficiency persists, the car riding uneven roads with impressive fluency while at the same time exhibiting pretty good body control given the size and weight of the thing. It’s no sports car, certainly, but there’s no need to cautiously bimble down winding roads for fear of upsetting the big, stoutly built German. 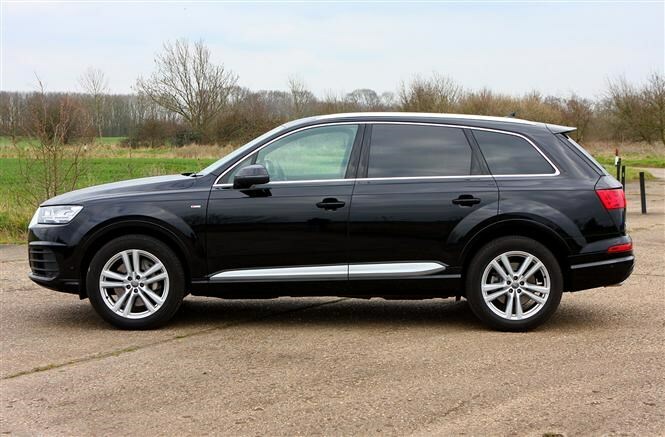 And the Q7 can summon plenty of speed, the 272hp V6 TDI proving an effortless, brawny performer. It’s a deeply impressive powertrain, one that puts the XC90’s main shortcoming into sharp focus. Thanks to its space-seeking packaging, the Volvo relies on downsized four-cylinder engines; diesel D5, petrol T6 or Twin Engine hybrid T8. They’re fine but they lack the smooth punch and charisma of the V6 Audi unit, feeling coarse and unpleasantly vocal by comparison. 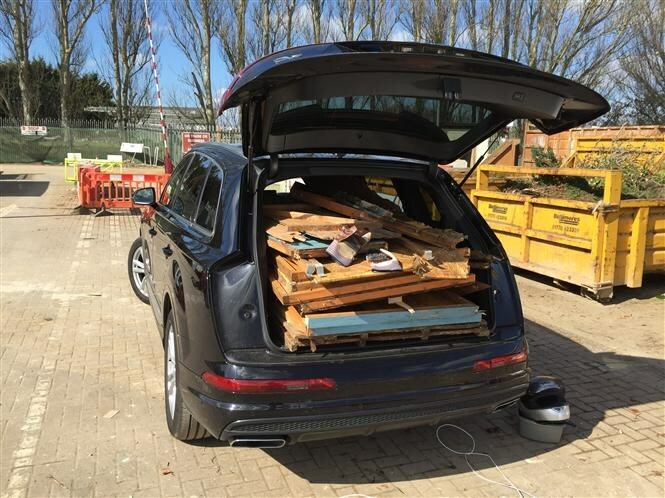 Loading a very smart, £65k SUV with garden waste and old shed panels feels wrong. I know cars of this kind are meant to be work horses – built for abuse by wild children, filthy dogs and the endless assault that is family life – but in S Line trim the Q7’s so smart-looking I had to line the boot with old blankets before I could allow myself to go on. When I did, the car swallowed an awful lot of stuff, namely one dismantled shed and most of the 10 years of stuff that had until then called it home. Loading is pretty straightforward too, with a low and flat load bay with the third row folded flat and a huge aperture to poke bits of old shed through. That said, I couldn’t wait to get home again, hoover out the boot and put things back to normal. For this is an immensely capable car I can well imagine you’d quickly grow to like and admire. Despite those angular, foursquare looks. 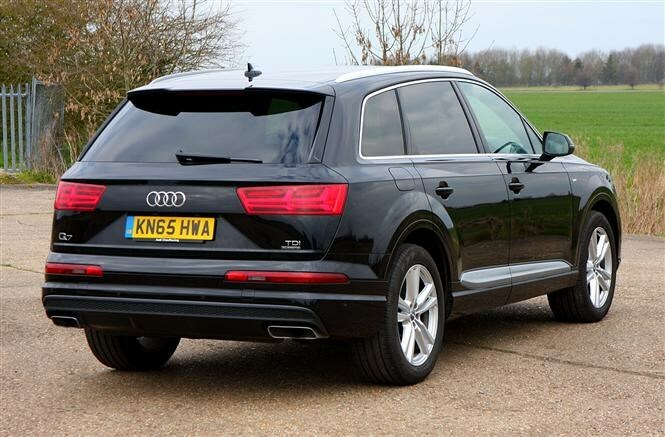 The time has come to part company with our Audi Q7, and to be honest it’s going to leave a big hole in our fleet. That’s not just because it’s the size of Jupiter, either. It’s also one seriously capable car. The most impressive thing is undoubtedly the technology on board. It’s rammed with kit that makes life both easier and more enjoyable. 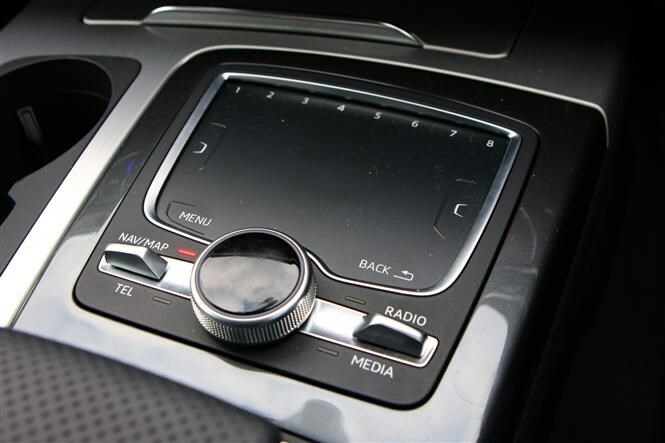 The Technology Pack, for example, is right at the forefront of modern car multimedia connectivity. 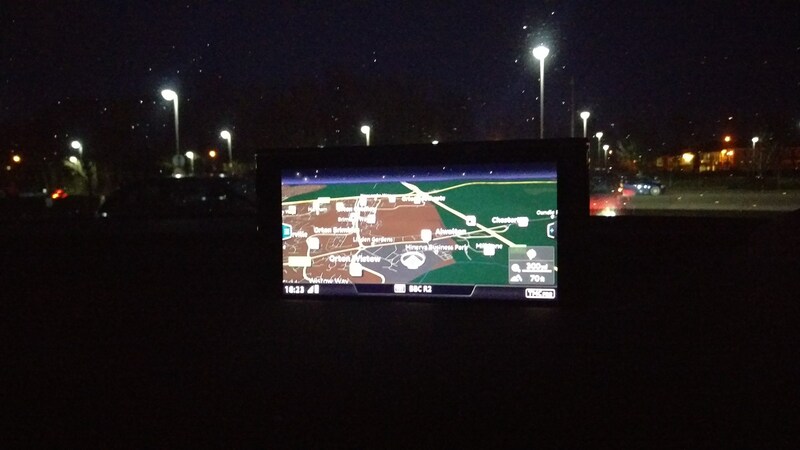 It groups a head-up display (which projects information such as sat-nav instructions onto the windscreen), the Virtual Cockpit (a screen taking the place of a conventional rev-counter and speedo to display mapping or trip computer details in a number of ways), the Phone Box (allowing advanced smartphone connection with streaming and wireless charging) and automatic high-beam headlights. Sure, that little lot costs £1,950, but it’s difficult not to be impressed with its integration and operation. We loved the £950 Matrix LED headlights as well. They allow you to drive around on full-beam at all times, removing parts of the beam that dazzle other drivers so you don’t annoy fellow motorists. And as a music lover, I particularly appreciated the Bose surround sound system (£1,100) with its rich, deep sound quality and neat installation in the cabin. I certainly can’t see an argument for upgrading further to the vastly more expensive Bang and Olufsen set-up. The engine and gearbox combo are ace as well. It was roundly felt in the office that there was more than enough power and torque on tap for most purposes, and the S tronic automatic ‘box made mincemeat of long journeys. It’s a very easy car to drive, the Q7, and it’s a very comfortable one too. If you spend a lot of time on the motorway you could do a whole lot worse. It wasn’t a perfect tenure, however. We couldn’t get our heads around the over-active stop/start system, resorting to simply switching it off when we got in the car, so we didn’t save much CO2 or fuel. That’s sort of the point of having it in the first place. But with that said, the fuel economy we achieved over our time with the car was very impressive for a car of this size and performance. The claimed 47.9mpg was a pipe dream, but at 31.1mpg it’s certainly not the most inefficient seven-seater on the market. Our Kia Sorento managed 31-35mpg with far less power. Another issue raised its head when we parked next to a Q5, which highlighted what turned out to be a lasting impression of the Q7. It’s a big Audi. By that we mean there’s little to distinguish it from the firm’s other models, at least visually; such is the Russian doll-esque nature of the brand’s line-up of SUVs. The cabin suffers a similar fate. It does everything very well, but there’s not enough in there to make it memorable. It’s a supremely capable machine, the Q7. It’s just not a car you buy because you’ve fallen in love with it. Should you buy an Audi Q7? It’s got to be a resounding yes. Will you appreciate its talents? Definitely. Will you find it emotionally appealing six months down the line in a world full of more interesting SUVs? Possibly not.